Tensions in South Ossetia escalate when a military vehicle carrying six Georgian police officers is hit by two remote-controlled explosive devices while travelling on a bypass road linking Georgian villages in the conflict zone with Georgia‘s interior. Violence continues in the evening and overnight on August 2. The South Ossetian side reports that six persons, including a member of the North Ossetian peacekeeping battalion, were killed and 15 injured in shelling and sniper attacks from the Georgian side. Georgian authorities report that seven people, including six civilians and one police officer, were injured in mortar attacks against the Georgian-controlled villages of Ergneti, Nuli, Zemo Nikozi and Kvemo Nikozi. The South Ossetian de facto authorities state that they will mobilize their troops, including volunteers from the North Caucasus and Russia, if tensions in the region escalate further. Russian airborne troops commander Valery Evtukhovich announces to Interfax their readiness to assist the Russian peacekeepers in South Ossetia if needed. 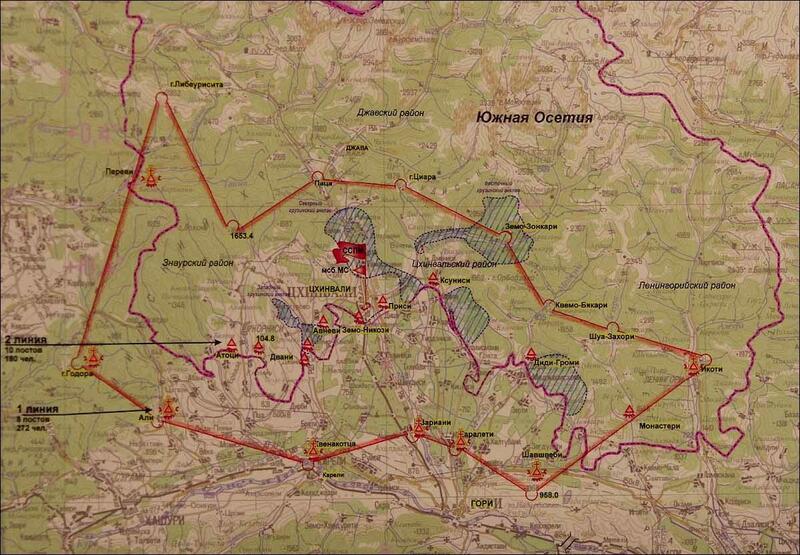 Russian armed forces complete the ”Kavkaz-2008” military exercise. However, rather than returning to their bases, the troops remain in their positions by the Georgian border. On August 3, the Russian Ministry of Foreign Affairs accuses Tbilisi of aggravating tensions in the South Ossetian conflict zone and announces that Moscow is undertaking efforts to defuse tensions on the ground. Georgian State Minister for Reintegration Temuri Yakobashvili states that Moscow is attempting to stage an illusion of war, aimed at derailing the peace processes in Georgia‘s separatist regions. In Abkhazia, de facto President Bagapsh declares that the Abkhazian side will refuse to take part in talks with the Georgian side and the Group of Friends until tensions in South Ossetia deescalate. The de facto South Ossetian authorities announce that 819 women and children are being evacuated from the conflict zone to North Ossetia. The Russian chief negotiator in South Ossetia, Yuri Popov, announces that bilateral talks between the Georgian and South Ossetian authorities will take place under Russian supervision in Tskhinvali on August 7. Ca. 50 Russian journalists arrive in Tskhnivali, expecting ”something to happen”, as reported to RFE/RL among other by Said Tsarnayev, a freelance reporter for Reuters, who stumbled upon the journalists when coming to Tskhinvali on the 7th. South Ossetian de facto leader Eduard Kokoity and chief negotiator Boris Chochiev declare their refusal to take part in the meeting with the Georgian side scheduled for August 7, stating that the South Ossetian side will only agree to talks within the JCC format (refused by Tbilisi since March 2008). Tensions escalate again in the afternoon with exchanges of fire between the Georgian-controlled villages of Avnevi and Nuli and the Tskhinvali area. The South Ossetian de facto authorities report that 18 persons have been injured in overnight shelling attacks against the breakaway capital of Tskhinvali and the South Ossetian-controlled villages of Khetagurovo, Dmenisi, Sarabuki and Ubait. The Head of the South Ossetian Security Council, Russian officer Anatoly Barankevich, announces that armed groupings from North Ossetia are headed towards South Ossetia to assist the separatist army to fight the Georgian troops. Georgian State Minister Temuri Yakobashvili departs for South Ossetia in the morning to participate in scheduled talks with the South Ossetian side, but neither the Russian chief negotiator Yuri Popov, nor the South Ossetian side, shows up. Yakobashvili is received instead by Russian peacekeeping commander Marat Kulakhmetov, who states that Russia has lost control over the actions of the separatist army and advises the Georgian government to declare a unilateral ceasefire to allow Russia to defuse tensions in the conflict zone. Shelling and shooting between the Georgian armed forces and South Ossetian rebels resume in the afternoon, killing and wounding several servicemen from both sides. In Tbilisi, the Georgian authorities receive foreign intelligence reports about movement of Russian troops towards the Roki tunnel, connecting North Ossetia with the South Ossetian conflict zone. Georgian President Saakashvili consults Western diplomats and is advised by U.S. Deputy Assistant Secretary of State Matthew Bryza not to fall into a trap and to avoid a confrontation with Russia. At approximately 7 PM, the Georgian government announces its decision to cease fire in order to defuse tensions and offers to engage in talks with the South Ossetian side. A few hours later the Georgian authorities report that several Georgian-controlled villages, including Avnevi, Prisi and Kurta, have come under heavy fire from the South Ossetian side. According to multiple and consistent Georgian sources (including witnesses to the discussions), at approximately 11 PM Georgian President Mikheil Saakashvili receives information that a convoy of over 100 Russian military vehicles is passing through the Roki tunnel. The Georgian government informs U.S envoy Bryza that it has no other choice but to advance towards the tunnel in an attempt to push the Russian troops back. Shortly before midnight, the Georgian Ministry of Defense announces its decision to restore the constitutional order in South Ossetia. Russian Defense Ministry sources, meanwhile, claim its forces did not enter Georgia until the afternoon the next day, but have failed to state the exact time of entry. From midnight on August 8, Georgian troops begin an attack intended to destroy the road connecting the Roki tunnel with Tskhinvali, and advance towards the breakaway capital. Georgian forces seize several South Ossetian controlled villages located on higher ground around the breakaway capital. According to Georgian authorities, at approximately 1 AM the Georgian troops succeed in shelling the road south of the Roki tunnel, thus delaying the advance of the Russian convoy. At 2 AM, Georgian ground troops reach Tskhinvali and begin firing rockets against governmental buildings in the city. The shelling of the city continues overnight. In the early morning, the Georgian side reports that additional Russian troops have passed the Roki tunnel and are advancing towards Tskhinvali. At 8 AM, the Georgian air force bombards the Gupta bridge (connecting the region of Java, south of the Roki tunnel, with Tskhinvali), delaying the advance of Russian units on approach to Tskhinvali. At 10 AM, the Georgian government announces that 1,500 of its 9,000 troops have entered Tskhinvali and that they now control the main part of the conflict zone. At approximately the same time, a first Russian military aircraft enters Georgian airspace from the South Ossetian side, firing several missiles against a radar station in the Georgian-controlled village of Shavshvebi. Air attacks are also carried out against the villages of Variani and Kareli, located 20 km outside the conflict zone, and against the city of Gori. Over the next two hours – that is, only 12-14 hours following the Russian move into Tskhinvali – Russian air and ground troops launch a heavy counter-attack in the South Ossetian conflict zone, which forces the Georgian military out of Tskhinvali. 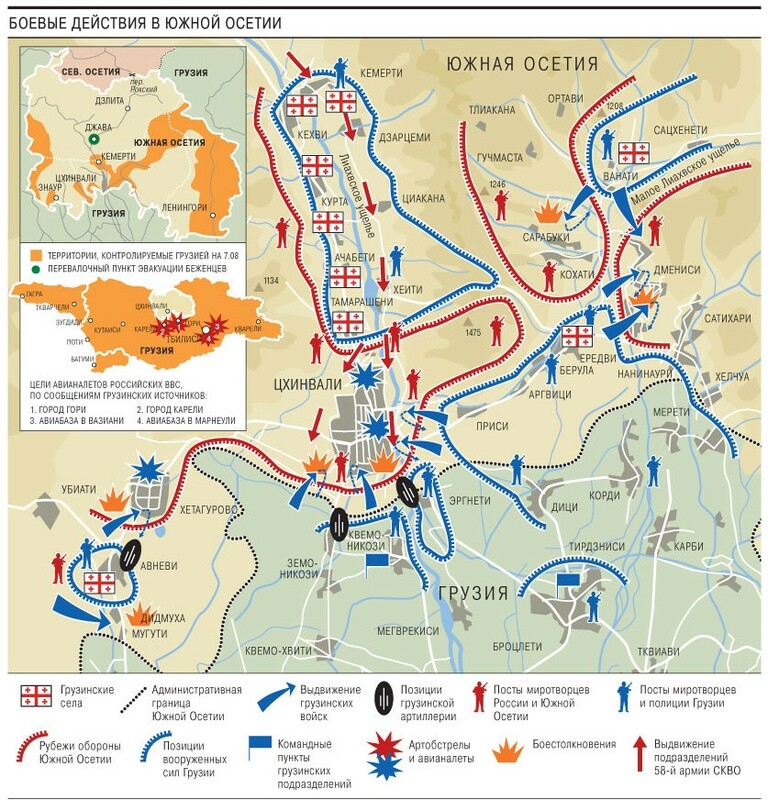 Fighting continues throughout the afternoon, with Georgian troops attempting to push back into the city, but intense artillery and air attacks from the Russian side push them back. Between 3 and 5 PM, three military bases, Vaziani, Marneuli and Bolnisi, all located within 50 km of Tbilisi, are attacked by Russian jets. The Marneuli base is bombed on three occasions, reportedly causing casualties and the destruction of three Georgian military jets and several military vehicles. At approximately 7 PM, Georgian forces come under additional intense fire from ground forces of the Russian 58th Army, which entered Tskhinvali through the Dzara bypass road, west of the breakaway capital. At approximately 8.30 PM, the Georgian troops are forced to retreat from Tskhinvali, holding their positions south of the city. Throughout August 8, Georgia is exposed to continuous cyber-attacks, disabling access to numerous Georgian websites. Meanwhile, Russian Defense Ministry officials state that Georgian shelling killed of 2,000 civilians in South Ossetia. However, official figures released by the Russian Prosecutor General on August 21 put the number of dead at 133. Overnight on August 9, Russian jets carry out several attacks against the Black Sea port of Poti. Attacks are also carried out against the military base and railway station in the town of Senaki in western Georgia, causing several casualties. The Vaziani base close to Tbilisi is bombed again. Bombs also fall close to the Baku-Tbilisi-Ceyhan oil pipeline in the Gardabani district, 20 km southeast of Tbilisi. Throughout the morning and early afternoon, the Russian Air Force continues carrying out attacks against strategic targets around Georgia, including several attacks against the town of Gori, Kopitnari airport on the outskirts of Kutaisi and in the Georgian-controlled villages of Kodori in upper Abkhazia. Russia gradually increases its number of ground troops in South Ossetia, outnumbering the 9,000 Georgian troops by nearly two to one. Over 300 Georgian troops go missing in the heavy fighting. The Russian Black Sea Fleet, deployed from bases in Sevastopol, advances towards the port of Poti and towards Abkhazia. In Abkhazia, the Abkhazian militia opens a second front in the war, launching an attack against the Georgian-controlled Kodori gorge. In the late evening, Russian forces bomb Chkhalta, home to the Georgian-controlled administrative center in Abkhazia. 6,000 new Russian troops arrive through the Roki tunnel to South Ossetia. 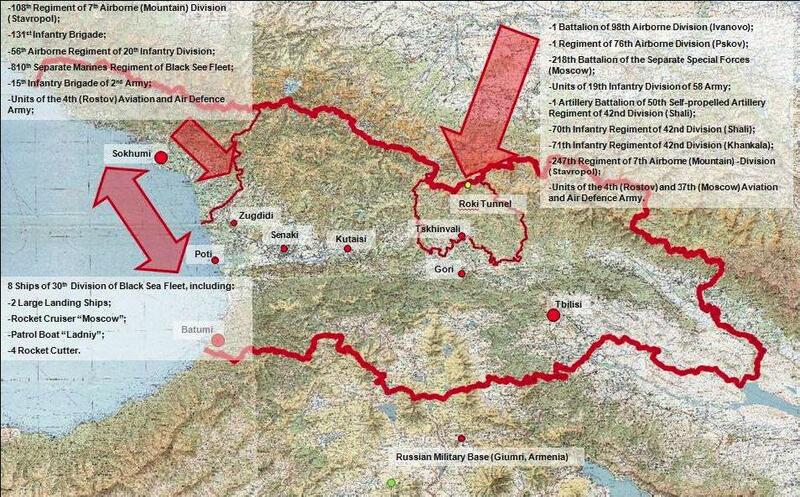 Meanwhile, 4,000 Russian ground troops are deployed by sea at the port of Ochamchire in the Abkhazia conflict zone. Russian Air Force units taking off from Dagestan bomb the Tbilisi airplane factory. Georgian troops retreat from South Ossetia to the city of Gori. Russian General Sergey Chaban, head of the CIS Peacekeeping Force in Abkhazia, demands Georgian officials in Zugdidi, Mingrelia, to disarm, citing the arrival of 9,000 troops and 350 tanks that would otherwise be deployed into Georgia‘s interior. The Russian air force carries out several attacks in the regions bordering the Abkhaz conflict zone, including the Zugdidi area and Upper Abkhazia. Abkhaz and Russian ground troops engage in joint attacks against the Kodori valley. The highway connecting eastern and western Georgia comes under attack by the Russian Air Force. A bridge on the highway is bombed. The city of Gori is also exposed to new air attacks. The Georgian Ministry of Foreign Affairs passes a formal request for ceasefire to the Russian Embassy in Tbilisi. Overnight on August 11, Russian aviation destroys the civilian radar stations in Shavshvebi, west of Tbilisi, and Makhata, 5 km from the capital. Attacks are also carried out in the Batumi area on the Black Sea coast, and against an airfield in Dedoplistskaro by the Azerbaijani border. In the early morning, the town of Gori is exposed to new air attacks, destroying civilian apartment buildings. Attacks are also carried out against the airport in Senaki, and against Georgian positions in the Kodori valley in Upper Abkhazia. In the late afternoon, Russian ground forces enter the cities of Zugdidi and Senaki in northwestern Georgia. Russian ground troops also advance towards the town of Gori, attacking and entering surrounding villages. Russian battleships block the Black Sea coastline, preventing Georgian cargo ships from reaching Georgian Black Sea ports. In the late evening, Russian ground troops take control of Gori, cutting the highway connecting eastern and western Georgia. The Georgian authorities call on its troops to concentrate around Tbilisi to protect the capital, as reports on the advance of Russian ground troops towards Tbilisi emerge. Throughout August 12, Russian aviation attacks numerous targets in the vicinity of Tbilisi, including new attacks against the Vaziani base, and villages in the districts of Kaspi, Khashuri and Kareli. An area close to the BTC pipeline in Kvemo Kartli is bombed. The city of Gori is exposed to new bombings, causing a number of civilian casualties. The Gori broadcasting station is stormed and destroyed by Russian ground troops. Reports of ethnic cleansing in Georgian villages emerge, later confirmed by international human-rights bodies. South Ossetian militia enters and attacks villages close to Gori, looting and destroying civilian homes. In a meeting with French President Nicolas Sarkozy in Moscow, Russian President Dmitry Medvedev signs a cease-fire plan. The plan provides for the withdrawal of troops from both sides to their positions as of August 7, an end to military actions, and free access for humanitarian aid. President Sarkozy departs to Tbilisi to present the plan to the Georgian side. Attacks against Georgian villages close to the South Ossetian conflict zone continue. Russian troops move from Gori towards Tbilisi, but reroute east before reaching the capital. Russian troops continue to destroy military infrastructure in Senaki, Zugdidi and Poti. The city of Gori remains under Russian control. After continuous attacks against civilian homes by Russian troops and South Ossetian militia, a large number of civilians escapes the city of Gori and surrounding villages. Western media reports that over 100,000 people are internally displaced as a result of the conflict. Human Rights Watch reports on the use of cluster bombs by Russia in the attacks against Gori and Kareli on August 12, which killed 11 civilians. Russian ground troops continue to arrive from South Ossetia and Abkhazia to the cities of Gori, Kutaisi, Poti and Khashuri. Civilians report continued looting and destruction of property. In the afternoon of August 15, the Borjomi National Park is firebombed at more than 12 locations. Large areas of forest are destroyed. Russian air attacks are carried out against several villages in the Kaspi discrict, including the wine factory in Okami. At mid-day, the Grakli railway bridge in Kaspi is mined and destroyed. Turkish and Ukrainian planes, tasked to assist Georgia in putting out the forest fires in Borjomi and Kaspi, are denied permission by the Russian military to enter Georgian airspace. In the late afternoon, Russian ground troops enter the town of Akhalgori, a Georgian village in the former South Ossetian Autonomous Region, never under Tskhinvali’s control. The troops offer Russian passports to the population. President Medvedev promises President Sarkozy a withdrawal of Russian troops in Georgia to commence on August 18. German Chancellor Angela Merkel arrives in Tbilisi after talks with President Medvedev in Moscow and stresses the urgency of immediate Russian withdrawal from Georgia and a German preparedness to contribute peacekeepers to the conflict zones. The Russian Armed forces claim to have begun its withdrawal from Georgia. Georgian government sources state there are no signs of withdrawal. Russian armored vehicles remove a Georgian police roadblock at the village of Igoeti, halfway between Gori and Tbilisi. Georgian sources report additional Russian troop movements within Georgia. Reuters reports there are no indications that Russia has started to withdraw its troops. U.S. Secretary of State Condoleezza Rice says Russia is delaying its withdrawal from Georgia and urges an immediate fulfillment of the cease-fire agreement on Russia’s part. The Russian MFA pushes for a discussion of Abkhazia’s and South Ossetia’s status to be included in the sixth point of the cease-fire accord, and to reinforce the accord with a UN Security Council Resolution. The OSCE decides to send 20 observers to monitor the cease-fire in areas bordering South Ossetia, envisioning a future increase of observers to 100. NATO foreign ministers hold an emergency meeting, agreeing to set up a NATO-Georgia commission and deliver emergency aid to the country. Two Russian checkpoints are removed from Gori. Reports circulate that Russian forces are reinforcing their positions on other locations. Matyas Eörsi, representing the Parliamentary Assembly of the Council of Europe, reports there are no signs of any larger Russian withdrawal from Gori. U.S. government statements say the small signs of withdrawal so far are insufficient and urge that efforts be speeded up. Russia rejects a UN Security Council resolution on Georgia drafted by France, calling for a withdrawal of all forces to lines held before August 7 and stressing respect for Georgia’s territorial integrity. Russia’s UN envoy states the resolution fails to incorporate the six points of the cease-fire agreement. A U.S. government statement urges a complete Russian withdrawal and considers efforts to date minimal or non-existent. French Foreign Minister Bernard Kouchner states that certain troop movements from South Ossetia indicate Russia is beginning to remove its forces. A spokesperson of the Russian General Staff says Russian forces will withdraw its forces to what is termed ”the zones of responsibility of the Russian peacekeepers” by August 22. Explosions are reported from the Georgian military base close to Gori. Georgian officials state that Russian forces are destroying Georgian military infrastructure and ammunition depots in the area. The Russian Defense Minister claims Russia has withdrawn its forces in accordance with the cease-fire agreement, as it dismantles checkpoints and moves troops from several locations in Georgia, including Gori and Iogeti. Russia however states it intends to maintain troops and checkpoints within zones of responsibility of Russian peacekeepers outside Abkhazian and South Ossetian territory. These zones include Senaki, containing a Georgian military base and an airfield, the Poti port, and areas outside South Ossetia, including a portion of the Georgian east-west highway. Russia also states its intention to maintain 2,142 soldiers and a large amount of heavy equipment in Abkhazia, in addition to its peacekeeping contingent. Georgia claims these measures are in breach of the cease-fire agreement. This stance is supported by a U.S. government statement, terming the Russian troop withdrawals insufficient and urging Russia to comply with its obligations under the cease-fire agreement and remove all its remaining forces on Georgian territory. South Ossetian leader Eduard Kokoity states all Georgian enclaves in South Ossetia are now ”liquidated”. U.S. and German government statements request Russia’s immediate withdrawal from all remaining positions within Georgia. The German statement requests Russian forces outside South Ossetia to be replaced by OSCE observers. Russian forces withdraw from the Georgian military base in Senaki, but keep a checkpoint outside the town. The US destroyer USS McFaul arrives in Batumi, but anchors at sea since its draft is too deep for the port. A train carrying fuel exports from Azerbaijan explodes close to Gori. Georgian officials state the train hit a mine left by Russian troops. President Sarkozy’s press office states an agreement has been made to replace Russian forces in the South Ossetian buffer zone with OSCE monitors. Russia denies agreeing to this. The Russian upper house of Parliament passes an appeal to President Medvedev to recognize Abkhazia and South Ossetia as independent states. The following day, President Medvedev expresses his intention to recognize the two territories. Strong verbal western reactions follow. The August 2008 war between Russia and Georgia has substantial implications for the security of Georgia, the broader former Soviet Union, Europe and the United States. Indeed, it is increasingly apparent that the war forms a turning point in post-Cold War European politics. The following pages suggest conclusions that may be drawn regarding the events themselves, as well as their implications for Georgia, its neighbors, and the West. The Georgian government had for several months prior to the war been operating under the fear of Moscow trying to provoke it into war. However, since the Russian provocative actions were centered around Abkhazia, not South Ossetia, Tbilisi was caught unprepared by the escalating tensions in the latter region in late July and early August. o The rapid deployment of coordinated ground, air and naval attacks within hours of Georgia’s entry into Tskhinvali, which could not have been undertaken without meticulous and long planning – especially the landing of several thousand troops and armor by sea in Abkhazia. o The political recognition of the independence of Abkhazia and South Ossetia, while retaining firm military and political control over these territories and their leadership. It is therefore beyond reasonable doubt that Russia‘s invasion was premeditated. Therefore, it is highly likely that any pretext – real or conjured – would have been used as a rationale to intervene. Russia’s invasion was hence not a response to the situation in South Ossetia, but a move with strategic aims that far surpass South Ossetia. Indeed, as subsequent Russian statements have confirmed, the Russian aggression appears to have sought to punish Georgia for its pro- Western foreign policy, and to achieve the demise of the Georgian government. o Tskhinvali is the first and main obstacle to an invading force from the north, lying just at the foothills of the Caucasus mountains, from which the terrain opens up to the south, toward Gori. o By seeking control of Tskhinvali and the road north of it connecting to Java and the Roki tunnel, engaging the Russian forces there, the Georgian defense forces were able to delay the Russian invasion into Georgia proper, perhaps even enough to forestall a possible military move against the capital Tbilisi, only 50 miles from Gori. Russia mounted a sophisticated disinformation campaign, accusing Georgian forces of widespread human rights violation in South Ossetia, and gaining traction in the western media. While it is likely that Georgian forces indeed did hit a limited number of civilian targets, independent human rights organizations have been able to substantiate fewer than 150 deaths there, in stark contrast to Russia’s initial claim of 2,000 deaths and allegations of ethnic cleansing. Irrespective of how the war started, Russia‘s response lacked any proportion to the stated aims and rationale – and indicated this war was only ostensibly about South Ossetia. o Russia enforced a blockade of Georgia‘s Black Sea coast, followed by the bombing of a railroad bridge connecting western and eastern Georgia, and further moves to effectively threaten Georgia‘s statehood and economic viability. While Russia claimed to intervene on the basis of humanitarian concerns, its forces subsequently permitted or endorsed the systematic ethnic cleansing of ethnic Georgians from South Ossetia. UN Satellite images available at [http://unosat.web.cern.ch/unosat/] provide graphic evidence of the systematic destruction of Georgian villages in the conflict zone, mainly after the end of major hostilities. While the international community, led by the European Union, reacted to the crisis relatively rapidly, the international reaction lacked coherence and clarity. o Western states failed to foresee Russia‘s invasion in spite of multiple indications that it was forthcoming. o Western leaders failed to plan for the contingency of Russia simply ignoring the terms of a cease-fire agreement it had signed, and failed to prevent Russia from setting up buffer occupation zones outside the secessionist territories. When this happened, western leaders lacked instruments to respond. o French and American negotiators appear to have failed to understand the consequences of the terms of the cease-fire agreement they negotiated, most specifically the loopholes and lack of clarity. The subsequent clarification letters sent by President Sarkozy, attached in appendix to this report, testify to this. European and international institutions failed to respond coherently to the war, much as in previous crises in the region such as the Tsitelubani attack a year prior to the war, the downing of a Georgian UAV in March, and Putin’s April 16 decree. Internal divisions in the EU and NATO, and a weakened U.S. administration, all combined to provide Moscow with what it perceived as a low-risk opportunity to punish Georgia for its independent foreign policy, halt NATO’s expansion, and restore its own primacy in the former Soviet Union. For the first time since 1979, Moscow waged a premeditated war of aggression against a neighboring state. This took place on the European continent, against a member country of the Council of Europe and the OSCE, with a democratically elected government. Russia has hence passed a key threshold in its exercise of power. In spite of Moscow’s subsequent recognition of the independence of South Ossetia and Abkhazia, its direct ambitions in Georgia were not related primarily to the conflict zones. While control over the conflict zones was and has long been a part of Moscow‘s agenda, the direct objective was the destruction of Georgia‘s democracy and its economy, and the overthrow of President Saakashvili’s government. During the spring and summer of 2008, the government of Georgia with some exceptions responded in a responsible manner to continuous and escalating Russian provocations. Moscow therefore failed to provoke Georgia to a war in Abkhazia, which may explain its subsequent move in late July to shift the focus of tensions to South Ossetia. The Kosovo ”precedent” cited by Moscow lacks basis in reality; in fact, Russia stands the Kosovo ”precedent” on its head. In Kosovo, as in Bosnia, western multilateral intervention sought to prevent ethnic cleansing from succeeding, rewarding the victims of ethnic cleansing. In Abkhazia and South Ossetia, Moscow explicitly rewarded and endorsed ethnic cleansing. This includes both the ethnic cleansing of over 240,000 persons, mainly ethnic Georgians, from Abkhazia in 1992- 93, and the ethnic cleansing of several tens of thousands of ethnic Georgians from South Ossetia as a direct result of Russia‘s invasion. NATO’s decision in Bucharest not to grant MAP to Georgia and Ukraine inspired Moscow to action, believing it had a window of opportunity to stop these countries from exercising their sovereign choice in foreign and security policy. The West’s refusal to seek the internationalization of mediation and peacekeeping mechanisms on the Abkhazia and South Ossetia conflicts; and its pressure on Georgia not to withdraw host country consent for Russian peacekeeping forces during 2008 in spite of the obviously biased nature of these formats, allowed Russia to portray its invasion as a part of its peacekeeping mission. The West’s failure to attach costs to Russia‘s earlier and escalating aggressive acts against Georgia and other post-Soviet states created a sense of permissiveness and impunity that prevented cooler heads in Moscow from prevailing against the hardliners led by Vladimir Putin. More broadly, appeasement policies towards Moscow served to strengthen the most autocratic, imperialist and adventurist forces in the government, while weakening the moderate and progressive forces. That said, Russia’s decision to wage a war of aggression in Georgia may be a sign of might, but not one of strength. In fact, it indicates that Russia for years failed to reach its political objectives in the South Caucasus with political instruments, and saw no other option but to employ war, the ultimate and most costly instrument to its international reputation, to achieve these objectives. This war was initiated at a time when Russia is led by an unstable tandem in power, with unclear distribution of powers between President Medvedev and Prime Minister Putin. Whether this was a coincidence or a factor in the launching of the war deserves closer study, as it reflects upon the type of regime in power in Moscow. Russia’s stock market reacted with a deep plunge to the war, providing a powerful indication of large investors’ interpretation of what the war says about Russia’s stability. In the absence of a tangible Western reaction that attaches costs to Russia‘s policies, Moscow is likely to draw the conclusion that the use of military force to accomplish foreign-policy objectives in Europe is useful. • Russia has mounted a direct challenge to the norms and principles of European security. This challenge arguably constitutes the most serious danger to the European security architecture since the Cold War ended, because it undermines the very assumptions that European security is built upon. While Europe has been moving toward the realization of a zone of prosperity, peace and democracy, Russia seeks a return to a division of the continent into spheres of influence. A Russia that behaves in this manner cannot be a viable partner for either the United States or the European Union. It is imperative to act by sending strong signals to both Russia and the states on its periphery. Strong moves to strengthen the statehood and independence of Georgia and Ukraine in particular are needed; as are steps to attach costs directly to Russia for its aggression. o Western powers must strongly denounce Russia‘s direct territorial claims on Georgia, as well as resist the creation of occupation zones in Georgia‘s interior. o NATO should rapidly extend Membership Action Plans to Georgia and Ukraine, indicating to Moscow that its calculations were mistaken, and that aggression does not pay. o The United States should push strongly for security guarantees through NATO if possible, but bilaterally if not, to Georgia, Ukraine and Azerbaijan. This could take place through the extension of status as Major Non-NATO Ally (MNNA). The European Union should realize that had an internationalized peacekeeping and negotiation format been in place in South Ossetia and Abkhazia, Moscow would have been much less likely to go to war. It is therefore key for Europe to dispatch a peacekeeping mission to Georgia. o The first purpose of such a force would be to secure Georgian statehood by interposing a peacekeeping force that would serve as a deterrent for a new Russian aggression against Georgia‘s interior. This force would also reduce the likelihood of incidents of skirmishes occurring that could escalate to renewed war. o For this force to be effective, it needs to be more than symbolic, and to consist of peacekeepers, not observers. The EU should learn from the experience of the UN observers in Abkhazia, who were not even a concern for Russia when it opened a second front. o This force will in a first phase be practically obliged to focus its presence on the Georgian side of the current cease-fire lines. However, it is imperative that the deployment of this force not serve as a tacit legitimization of the new borders that Russia has illegally sought to draw. Therefore, the force’s mandate must include the entire territory of Georgia including the conflict zones, and its purpose in a second phase must be to deploy – whenever practically feasible – in the conflict zones, in order to provide the ground for the return of internally displaced persons. The U.S. and EU should design a substantial aid package to rebuild Georgia. o This aid package should focus on strengthening Georgia’s economy, and must but be one that makes Georgia selfsustaining. Emphasis should therefore be put on strengthening and guaranteeing private investment in Georgia, a goal that the government was working successfully towards prior to the war. o The package should pay considerable attention to supporting Georgian democracy, not least by strengthening institutionbuilding programs in the Georgian government and bureaucracy, as well as increased educational exchange programs. o The package should include substantial funds for the rebuilding of Georgia’s defense capabilities, enabling Georgia to move rapidly to NATO standards. The U.S. and EU should warn Russia in no uncertain terms about the strategic importance to them of the East-West transportation corridor, and the consequences for Russia of any attempt to undermine or sever this corridor. It should equally warn Russia of the unacceptability of attempts to overthrow neighboring countries’ legitimate governments, particularly democratically elected governments. Its decision to invest heavily in a modern military force was crucial to saving the country’s statehood, and may have ensured the survival of its government and its democracy in the face of external assault. Nevertheless, Georgia’s military remained unprepared for a ground assault, its training having been largely in counter-insurgency tactics, and Georgia lacked the capacity to prevent an aggressor from acquiring control over Georgia’s airspace. Georgia’s ambition to integrate into Euro-Atlantic collective-security mechanisms reflected a correct analysis of Russia’s aggressive ambitions toward it. Its democratic credentials were a key factor in the mobilization of western support that, albeit belatedly, took place, and it is therefore key for Georgia’s democracy to be further strengthened. That said, there are limits to the support Georgia can expect from the West for its defense and security, and Georgia has to take appropriate measures to include this consideration in its risk assessment. Russia’s occupation of Georgia’s interior is unlikely to be sustainable if met with substantial civil disobedience and strong international condemnation. o Or, to push ahead with the ambition of becoming truly independent states able to exercise their sovereign choice, risking a fate similar to Georgia’s or at the very least strong aggressive measure on Russia’s part. Russia has effectively nullified its credibility to serve as an honest broker in conflicts on or near their territory, including the Nagorno32 Karabakh and Transnistria conflicts. The West is unlikely to step forward to defend its own and their interests in the case of military aggression from a neighbor, be it Russia, Iran, or another power. The West’s failure to intervene credibly in Georgia reduces the prospects of strong Western action to strengthen and broaden the eastwest energy transportation corridor across the South Caucasus, and Central Asian states may be better served by turning to China to secure diversity in their energy exports. This entry was posted on 3 september, 2008 at 7:24 e m and is filed under Försvar - Defence, Georgia, Russia. You can follow any responses to this entry through the RSS 2.0 feed. You can leave a response, or trackback from your own site.